Thickener and Suspending Agent in gels, emulsions and creams. Use level: 1 to 10%. FIN-TICK AC is an acylic emulsion polymer specifically designed to impart suspending and stabilizing, as well as thickening properties. It does not require pre-dispersion, it dissolved instantly and form a dilute acid emulsion when added into water. A suitable neutralizing agent FINAD TEA must be added to obtain the desire viscosity. 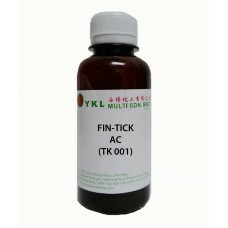 FIN-TICK AC is stable at the pH range 6 to 11. It is supplied in 30% actives in milky and white liquid. Add it into the water at the first step of formulas.